One of my favorite subjects in all of Walt Disney World, past or present, is the subject of dreams that never became reality, or what I refer to as, “The World that Never Was.” While I would admit that enjoyment of failure to accomplish dreams sounds a bit morbid or defeatist, the fact of the matter is that I am a realist, I understand and accept the fact that some plans are more sound and suited to be completed than others. 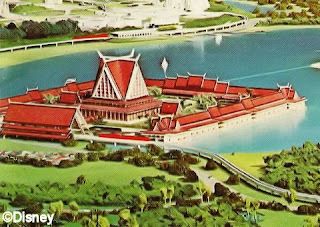 Some of the favorites, in the realm of “The World that Never Was,” are the never realized Monorail Resorts around the Seven Seas Lagoon and Bay Lake. 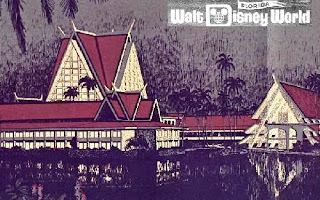 This week are we going to take a look at one of these uncompleted resorts, Disney’s Asian Resort. Long before the opening of Walt Disney World, in a time when our beloved world was nothing more than ideas on paper, there lived plans for no less than five resorts, which would be situated around the Magic Kingdom monorail Line. One of which was Disney’s Asian Resort. This resort was planned to sit on a square spit of land, constructed during the building of the man made Seven Seas Lagoon, this second of earth was visible for several years after the opening of Walt Disney World. 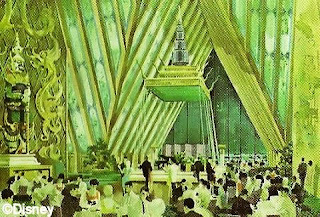 Scheduled to be constructed starting in 1974, the plans for this resort were inspired by the history and culture of Thailand. There would have been a main building in the center, which would have housed the front desk and check in, the resorts restaurants, shops and main lobby. I imagine that this would not have been unlike the Great Ceremonial House of the Polynesian Resort. The balance of the guest rooms would be in a large square building that would surround it. The furnishings, décor and even cuisine offered in this resort were to be reminiscent of that which one would find during a trip to Thailand. Original plans called for as many as 600 rooms, most of which would have been lagoon or garden view, with 50 suites available as well. The plans for the Asian Resort were scuttle in early 1973; the reason given was cost, due to the oil crisis the country was going through at the time. The square plot of land, jutting out in to Seven Seas Lagoon was left empty for the next 15 years or so, until construction finally began in the late eighties. Unfortunately for fans of the Asian Resort concept, the construction that took place was not for this resort, but instead for the building of Disney’s Flagship, the Grand Floridian Resort & Spa. As a child I can still remember seeing the large grassy plot of land where the Grand Floridian now stands and wondering what fantastic ideas would come into being on that spot. 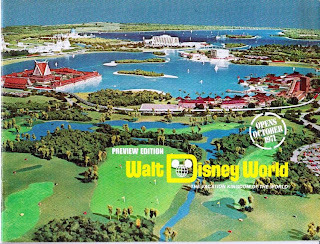 Today, I am a huge fan of the resort which stands in its place, but I still think fondly upon what it would be like to spend a vacation in this little piece of the world that never was. I love this description and the concept art. We were told by a cast member once that, originally, guests were going to be able to walk from the Asian Resort right into the Magic Kingdom's Adventureland. What an experience!